Kid Galahad has come a long way from the tearaway youth who was expelled from school and banned from travelling on all public transport in Sheffield. The 24-year-old, real name Abdul-Bari Awad, is the current European super-bantamweight champion after his win in March over Spaniard Sergio Prado saw him cement his reputation as one of the brightest stars in British boxing. However, things may have worked out a lot differently for him had it not been for a chance meeting with former world champion Prince Naseem Hamed in his local mosque. 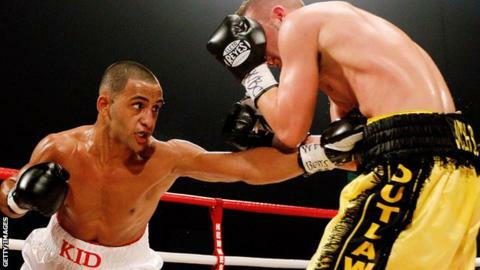 "I was never in a gang but was constantly in and out of trouble as a youngster," Awad told BBC Sport. "I would get into trouble for fighting on the buses and that's why I was banned from all public transport. "I was quite a small kid and wanted to get a little bit bigger and decided to go to a gym in the town centre. The gym had a boxing ring and I would spar with my friend and just mess around and do some shadow boxing. That's when I decided I wanted to become a professional boxer. "When I met Prince Naseem I told him I wanted to become a champion and he said that I should speak with his former trainer Brendan Ingle." Dublin-born Ingle, who has trained four world champions, is the man who guided Naseem's career - from a small seven-year-old sent to the gym by his dad to learn how to look after himself to the WBO featherweight champion of the world. Based in Sheffield, Ingle also looked after the careers of Herol Graham, Johnny Nelson and Clinton Woods. He is clearly a man who knows his trade - and he made an immediate impression on Awad. "My mother and I travelled to meet Brendan at his gym in Wincobank," recalls Awad. "We had a chat and he said if you want to be a boxer then make sure you're at my gym for six in the morning. "The next day I was there on time and Brendan started to take an interest in my life. When he found out that I was expelled from school, he told me that he wouldn't train me if I didn't take my education seriously. "Brendan then helped to find a school to take me and I stopped getting into trouble. Boxing kept me motivated and disciplined." Awad was born to Yemeni parents in Doha, Qatar, and his family moved to Liverpool when he was two, then to Sheffield when he turned 13. His boxing moniker came about after watching the Elvis Presley film Kid Galahad with Ingle and his sons John and Dominic. "That's when Brendan suggested my boxing name," said Awad. "He said Elvis was the king of rock and you're going to be the king of the ring." After Ingle's retirement, his sons took charge of coaching Galahad, who is unbeaten in all 16 of his fights since turning professional in 2009. "Nothing really impressed me when I first met him," said Dominic. "He was one of those over-hyperactive kids. But then, after a few weeks of training him, we realised he was good at taking instructions and was always asking questions. "A lot of kids that come here do not have the right motivation and just want to become famous through boxing. He realised early on that he needed to stick with me and Brendan and avoid learning bad habits in the gym. "I am confident and expect him to go on and become a world champion." Last month's win over Prado saw him add the European belt to his British super-bantamweight title he claimed last September, and on 10 May he will aim for the Commonwealth belt when he takes on Australian Fred Mundraby in Sheffield. Beyond that, the ambitious Awad has set his sights on taking on Carl Frampton, who held the European belt before him, and Bury's WBA champion Scott Quigg. "If there was a fight today against Frampton or Quigg, then I wouldn't hesitate to take it," says Awad, who has built a reputation for having a solid defence and fast hands. "They're both fit and strong, but I'm also fit, strong and smart. "They know I am a threat but I need to get myself into a position where they can't avoid me and that will be by moving up in the rankings. "Ideally, we will try and have two to three more fights before the end of this year and aim for a world title shot in 2015."